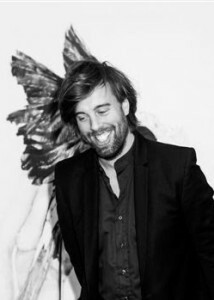 Teun Castelein (1980) is an artist known for a wide range of entrepreneurial adventures. He calls himself a ‘one-man conglomerate’ operating from the city of Amsterdam with the ambition of overtaking the world. With his projects he researches and questions the functioning of the free market and the chances of survival for the artistic and humanistic. Castelein graduated from the Sandberg Institute (MA program of the Gerrit Rietveld Academy) in 2007 with offering advertisement space on the façade of the institute. For almost five years he is teaching ‘Branding’ at the Willem de Kooning Academy in Rotterdam and since this year ‘Social Dreaming’ at the University of the Underground. His work is widely covered by national and international media. For his shipping company ‘Lampedusa’ he received a Peace Pigeon at International Peace Day 2017. Castelein was nominated ‘citizen of the year 2016’ by the municipality of Amsterdam. He is also a member of pop rock collective ‘The Geert Wilders’.